Store, protect, and transport photography, video, electronics, and other gear with the silver Pelican 1120 Case without Foam. This waterproof, crushproof, and dustproof case is constructed from ultra-high impact polypropylene. Users will appreciate the built-in purge valve, easy-open double-throw ABS latches, and protectors for an optional padlock. The case has an O-ring seal and a large fold-down carry handle. 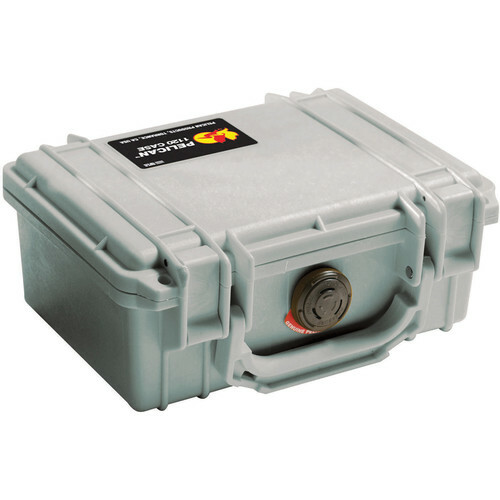 1120 Case without Foam (Silver) is rated 5.0 out of 5 by 9. Rated 5 out of 5 by Holt Video Productions from Pelican = Awesome I ordered two of these one with foam, one without. In the one with foam, I keep my GPS, Digtial Camera, Flashlight, and accessories. The Pick and pluck foam keeps them all safely in place, and I don't have to worry about water or even dropping them. Great product. Rated 5 out of 5 by Anonymous from Perfect Case Bought this to have a small indestructable/waterproof case for my small electronics when I go camping, road trips, etc. Perfect size and solid as a rock with nice latches. Just pay attention to the inside dimensions provided and your good to go. Rated 5 out of 5 by Anonymous from Small Pelican Case Great reliable waterproof case - my second Pelican. Using this one for first aid kit storage while kayaking. First one is used for camera (case with foam insert). So satisfied with first case and reliability, I had to buy a second one. Rated 5 out of 5 by the governor of nh from Good Protection for Camera Assessories This smallish case fits into our camera assessory case and holds the wireless mics and transmitters. We used our own foam for cutouts and padding. Lighweight and inexpensive. Rated 5 out of 5 by Mark from Great small case This is exactly what you would expect from Pelican, a great product. It is built just like it bigger brothers but small enough for your little items. I highly recommend!!! Rated 5 out of 5 by James from Perfect case for accesories What can I say? It's a Pelican case and it's virtually indestructible. I use this case to store and transport my Nikon SB-400 flash, ML-3 Remote release and Hoodman Loupe. Rated 5 out of 5 by gt from Great case for boating Clasp are easy to open/close and case seals tight.? I use it for phone, billfold etc when boating. Rated 5 out of 5 by David from Quality USA constructed product This is an excellent Pelican case. We use them in the field to house delicate equipment.